This image of the open star cluster NGC 7380, also known as the Wizard Nebula, is a mosaic of images from the WISE mission spanning an area on the sky of about 5 times the size of the full moon. 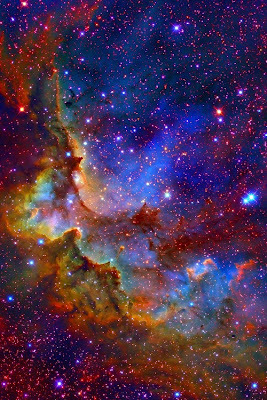 NGC 7380 is located in the constellation Cepheus about 7,000 light-years from Earth within the Milky Way Galaxy. The star cluster is embedded in a nebula, which spans some 110 light-years. The stars of NGC 7380 have emerged from this star-forming region in the last 5 million years or so, making it a relatively young cluster. WISE, the Wide-field Infrared Survey Explorer mission, scans the entire sky in infrared light, picking up the glow of hundreds of millions of objects and producing millions of images. The mission is designed to uncover objects never seen before, including the coolest stars, the universe's most luminous galaxies and some of the darkest near-Earth asteroids and comets. Its vast catalogs will help answer fundamental questions about the origins of planets, stars and galaxies. WISE joins two other infrared missions in space -- NASA's Spitzer Space Telescope and the Herschel Space Observatory, a European Space Agency mission. WISE is different from these missions in that it will survey the entire sky. It is designed to cast a wide net to catch all sorts of unseen cosmic treasures, including rare oddities. All four infrared detectors aboard WISE were used to make this image. NGC 7380 was discovered by Caroline Herschel in 1787. Her brother, William Herschel, discovered infrared light in 1800.